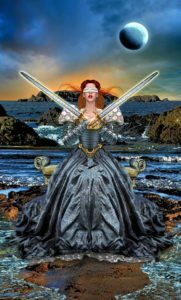 The Two of Swords, by Erik C. Dunne. Used by permission of the artist. Tea with Strangers is inspired by the Tarot Illuminati deck, by Erik C. Dunne, and the companion book by Kim Huggens. On a concrete bench set on rocks in the surf, a woman sits unmoving. 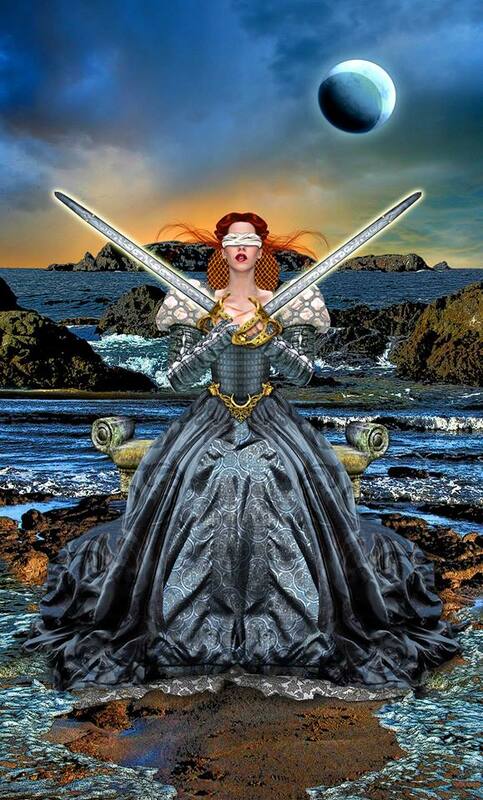 She is blindfolded and holds in front of her two crossed swords. The winds of storm whip her hair all around her face. The waters of the tide splash her feet; they have soaked her beautiful gown to the knee, and the air is saturated with the smell of salt and ocean life, seaweed and mollusk. It is not so cold that we are in danger of freezing, but cold enough that the splashes on my jeans are painful against my skin. I wrap tighter in my anorak, wipe the salt spray from my face with my sleeve and walk carefully from rock to rock until I am close to her. Those swords look really sharp. They look like the real thing, and with the grip she has on the wrought handles, I’m not eager to find out how well she’s been trained. I step back and clear my throat. Unfortunately, between the wind and surf, there’s no way she could hear me. Her face brightens. “I can do that?” She sets the swords on the bench, and we pick our way back across the rocks. 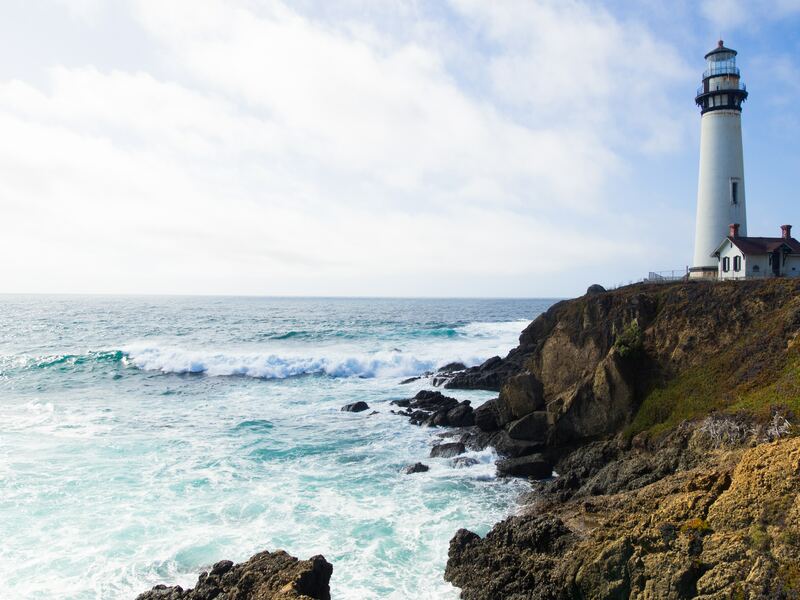 There is a lighthouse up higher on the rocks. The keeper is at the top, always, binoculars to his eyes, watching for ships that may come. He pays no attention to people who come and go in the cozy kitchen on the first floor. 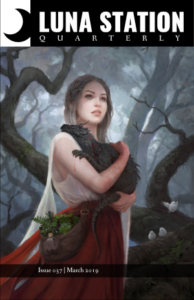 My lady of the Two of Swords warms her hands on the teacup, dries her face on the towel I find in the drawer, and stares wistfully into the fire in the hearth. I’m thinking about the work I’m revising, and the decision I have to make between implementing a major change that will require extensive rewriting, or going with the original idea, which may be less engaging for the reader, but which remains true to my original vision for the story. “Tough place to be in,” I say. “Do we die by this blade, or this one? Do we take what looks easy, and learn it was easy because it was right? Or do we take what is hard, and learn that hard work is always the best way? I just don’t know. I am stuck.” She slumps. “Have some more tea.” I fill her cup and put a warm biscuit on her plate. “Tell me, why do you wear the blindfold?” My intention is just to distract her from her distress, but as soon as I say it, she takes the blindfold off the top of her head and perks right up. It is, indeed, though also sweat- and ocean-soaked. It is a thick, soft knit of some kind, and looks like it carries more stories than one life could hold. The cozy lighthouse kitchen is a lovely place for me right now, but there are times, I know, when I am the one out there on the rocks. There’s no simple solution for my revision. I believe, though, that I’ll try what she suggested, and distract myself with something meditative, which for me is riding my bike on country lanes. As I pick my way back up the cliff to my home, I see the lady there, on her bench, storm raging around her while she sits frozen in her moment of decision – not frozen in indecision, but frozen in perfect peace, listening for the right answer.